My husband will vote for MAPS just to get this. He's been a whitewater kayaker all his adult life, and has had to go to Tulsa to "surf" the Wave or drive all the way to Arkansas for whitewater kayaking. This is certainly something unique, and will perhaps increase local interest in whitewater kayaking, as well as provide additional Olympic training facilities. I certainly hope we do get something like this; It would only add to the options that OKCitians will have for outdoor entertainment and activity. That is a great idea. I love the idea of adding something to do for fun in Oklahoma City. Plus it's would be great exercise and get people outside. MAPS 3 is a sham. Our police, fire and city workers are stretched to the limits.. Wake up OKC...i'm for growth, but lets add another cent to get enough workers to take care of these improvements. Betts, I was talking to the Parks Dept Director Wendell Whisenhunt at the Devon dedication. I am an avid surfer and he totally surprised me. Apparently we voted for a wave box for Wiley Post Park. He says it will be funded by the bonds in 2 - 3 years. It is the bond issue that keeps on giving. Here is a link to the company that builds the surfing equipment. The video is pretty cool too (top right menu). I am glad we are getting one of these for sure next to the skate park. Thanks for the link, Urban. Looks like fun. Keep in mind, public works projects such as MAPS 3 attract TONS of development and lots of out of state money, which in turn equates to millions more in local sales tax revenue annually. This annual sales tax revenue is usually used for police, fire and other such programs. More sales tax = more police and fire and other city positions. Killer. I'm stoked! I rode at the premier fake wave park in Mission Beach, San Diego back in January (my shoulder is still bothering me from it). I can't wait until we get our own!!! Explain how encouraging developmental density is going to stretch our emergency services and infrastructure. Does anyone have any statistics on how many more police and fire have been added post-MAPS I?? There are more proper ways to fund such things. MAPS 3 makes OKC a more desirable place to live, so that our population and city revenues will increase. No additional policeman or fireman have been added since 1995. No additional City Workers have been added since that same time. Your developmental density has required an additional police station in Bricktown. A station that was needed to protect families in bricktown during it's night life and events. A station that required police officers to be taken from already short briefing stations. Overtime has to be paid to officers just to have adequate protection every weekend. What about the other city services are they not stretched taking care of the additional structures from MAPS1? It's not just MAPS. It's not having done anything to add workers since before 1995. Population has grown but no additional workers. Now we are asked to vote yes for another 777 million dollar park for downtown. While no money is alloted to increase city services.. I don't know if citizens know that on any given night the entire south side of oklahoma city is patrolled by 9 Police Officers at times. Yup. Thats 9. there are an equal amount or more officers in bricktown on many nights. That's the ENTIRE South Side of Oklahoma City!!!! Doesn't the South Side of this city deserve to have Officers. This years budget called for 951. I believe the Dept. is currently 6 to 10 below the 951. In February of 1999 the Dept. was staffed with 999. So to answere your question none have been added, in fact the opposite has occured, they have lost 50 or so. Public safety personnel funding and funding for MAPS projects completely different things. We may very well need additional police officers in Oklahoma City, don't know, but if the City is going to provided funding for them, they will have to be doing from something other than a 'MAPS'-styled funding source. Personnel costs must be funded permanently and the MAPS projects are not funded by a permanent source. There seem to be enough around to give me speeding tickets. Yup, no shortage of cops looking to pull me over. This is a thread about kayaking and surfing infrastructure. Go hijack a thread somewhere else. I am all for expanding police protection and the fire department. However, I am not for facilitating the continual expansion into never-never land. It is obvious that to encourage people to live in a more urban area, that area will need greater appeal. That means a reason to move there over the suburbs at 180th street, better schools and a markedly better quality of life appeal. MAPS is about 30 year time frames. 10 years to build all of it, 20 years to enjoy it. It is about being competitive and healthy as a city. Right now we are blessed with flat to minor negative growth. A surge of growth and urban density as a result of this investment will pay great dividends in added tax revenue to support the long-term commitments required to expand city personnel. MAPS will not and is not designed to do that. We need to stop encouraging building on the cheap and making commitments to housing developers that we will perpetually maintain million dollar roads, water lines, other utilities, and protection personnel at the expense of the greater quality-of-life and American competitiveness of our city. Finally, this is a thread about kayaking and surfing infrastructure. Go somewhere else. That's a budget issue. If you have problems with the current budget, contact your council person, or vote for someone else. These issues have nothing to do with MAPS or MAPS 3. $1 billion was voted to improve city services in 2007.
ok, the whitewater facility goes on the river, or beside it. Where along the river. Also, the surf thingamabob, Wiley Post? I'm way too round to hang ten, but that's something the younger members of the clan might eat up big time. iron76hd has attempted to hijack this thread. However the whitewater facility quite simply looks awesome. That thing would be huge here and I could see it drawing thousands of people from the region here. 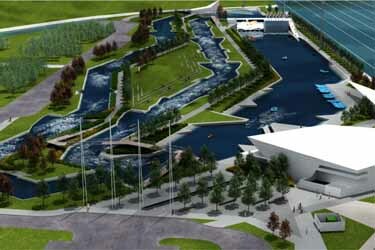 The whitewater facility would be on the river. I suspect it would be near one of the dams, as that way you have a gradiant, which is required to get the kind of water flow necessary to create rapids. He/She has hijacked every MAPS 3 thread. Can't even talk about MAPS anymore without hearing about how shortstaffed the police and fire depts are. Anyways, whitewater facility will be a great addition to the river. I'm stoked to learn that we already have money set aside for the faux surf park, let alone a whitewater facility. OKC will reap HUGE quality of life and tourism dividends from this long term.